In 2006, Oracle began trying to abscond with RHEL’s paying user base. On Thursday, Microsoft announced that it’s now going to give Oracle a similar treatment. What’s that they say about paybacks? Microsoft has declared war on Oracle, which is the type of story I wish was on Netflix. If it were, I’d make some popcorn, mix it with some M&Ms, sit back and binge watch. As it is, I’ll have to watch it unfold the old fashioned way, as it happens. Some of you might remember the hostilities which broke out between Red Hat and Oracle after Red Hat acquired JBoss. Until then, the two companies had worked hand in hand in something of a partnership which saw Red Hat helping its customers get Oracle’s business stack up and running on RHEL servers. According to news reports of the day, Oracle’s head honcho, Larry Ellison, thought he had Red Hat in his back pocket and happily referred clients who were interested in migrating Oracle’s stack to Linux from Unix or Windows to the Raleigh, N.C. based company. That all changed after Red Hat announced on April 10, 2006 that they had acquired JBoss, which was the largest supplier of open source enterprise middleware. Again according to news reports of the day, this put Ellison into something of a snit for a couple or reasons. In those days, Oracle was on a buying spree, using it’s pocketbook, market share, and muscle if necessary, to gobble up every software company it could find with products that would add beef to its own offerings. Early in 2006, the company had attempted to purchase JBoss in order to better compete with BEA Systems and IBM in the middleware market, reportedly offering the Atlanta based company $400 million. When just a few months later Red Hat announced it had purchased JBoss for an initial $350 million outlay, with up to $70 million to be paid at a later date, “subject to the achievement of certain future performance metrics,” Ellison was livid. Not only was he upset at having his offer spurned in favor of one he perceived as no better and even inferior, he also saw this as a breach of the loyalty he expected from Red Hat — one of those “after all I’ve done for you” sort of things. By acquiring JBoss, he thought, his back pocket partner was attempting an end run that would put it in direct competition with Oracle. Ellison decided to show Red Hat that two could play this game. In October he announced Unbreakable Linux, Oracle’s own in-house Linux distribution, a direct clone of RHEL which would henceforth be the Linux distro of choice for running Oracle products on Linux. At first Oracle made no attempt to hide the fact that its Linux distro was a line-by-line copy of RHEL, while offering support contracts at a fraction of what Red Hat was charging. “Support” mostly meant that Oracle was supplying Red Hat’s patches, as at the time Red Hat was making the application of patches easy. To add insult to injury — or more precisely, injury to injury — Oracle also began actively attempting to woo Red Hat’s clients by offering cheap support for RHEL with no need to migrate to Oracle’s own brand of rebranded Linux. Again, the support they offered was mainly paid for by Red Hat, with Oracle merely applying Red Hat’s patches, although Oracle claimed otherwise, and in fact, tried to make the case that its support was superior to that coming from Raleigh. This series of actions by Oracle created something of a brouhaha within FOSS circles. While it was true that Oracle didn’t seem to be breaking any terms of the GPL, under which Linux is licensed, it was widely believed that Oracle wasn’t obeying the spirit of the license. Unfortunately — or fortunately, depending on how you look at it — the law doesn’t take into consideration the “spirit” of anything. In 2011, the move by Oracle (along with a similar move by Novel) to poach RHEL subscribers, led Red Hat to change the way it distributed it’s Linux kernel code by making it difficult for Oracle and Novel to determine which patches had been applied and where. This might have been a necessary move by Red Hat, but it put the company in hot water with the FOSS community, where many thought that Red Hat, like Oracle, was now violating the spirit of the GPL. It was also seen by some as a move targeted at another RHEL clone, CentOS, a notion which Red Had immediately attempted to dispel. Flash forward to March, 2016 and it’s payback time, not-so-instant karma time or what-comes-around-goes-around time — pick your own descriptor. It seems that Microsoft has taken a page from Oracle’s playbook and now intends to do to Oracle what Oracle tried to do to Red Hat all those years ago. 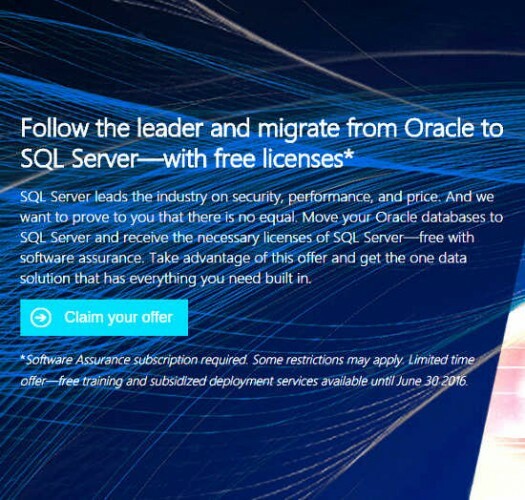 On Thursday at a Data Driven tech event in New York City, Microsoft said that Oracle customers who migrate to SQL Server 2016 will get free licensing for the lifetime of the product, as well as free technical support. The only requirements for companies wanting to take advantage of the offer is that they be Software Assurance customers at the time they apply for the freebie. They also must act quickly and sign up by June 30 in order to obtain full benefits, such as getting Redmond’s technical support staff on premises to help with the migration and to train staff. However, don’t be surprised if the deadline isn’t extended if the project starts to get serious traction. As part of the PR around this offer, Microsoft is claiming it can create a database system for about 10 percent of what a comparable system would cost from Oracle. From what I know about Oracle’s pricing, this should be easy, even for Microsoft. Microsoft also hints that SQL Server is more secure than offerings from Oracle, which is also probably true given Oracle’s horrendous security track record. This was the second big announcement made about SQL Server last week. On Monday, Scott Guthrie, the executive vice president of Microsoft’s cloud and enterprise group, announced that the new SQL Server will be the first to be ported to Linux, so obviously Redmond sees it as a big part of its future. Given Microsoft’s recent history, the porting of enterprise crown jewels to Linux wasn’t entirely unexpected. However, declaring war on Oracle is a complete surprise. The question now is, how will Oracle retaliate. If I know anything about Larry Ellison, it’s that he’s not about to take this lying down. As I said at the beginning, it’s time for popcorn and M&Ms. Come to think of it, Netflix probably wouldn’t be able to do this story justice, with or without HD. I want to see this on IMAX. Two of the largest Database companies fighting for a spot on the Linux wagon, who’d have thought. When was the year of Linux, and how did I miss it? I said it before and I’ll say it again. I don’t trust MS. And just because they’re dangling a carrot (called “SQL”) in front of the masses doesn’t mean they don’t have an ulterior motive. There is nothing MS makes that FOSS developers can’t refine and improve upon. I’m going to stay in my “all FOSS Universe” and watch this while observing fro ma distance the fallout of those who grabbed hold of Microsoft’s outstretched hand….I imagine it won’t be pretty, and I promise I won’t say “I Told You So”….LoL! So now we all know the real reason why Microsoft Corporation is making Microsoft SQL Server available for GNU/Linux systems — not in any way motivated by “love for Linux” (or the policies of open source software), but simply because it opens up a new market for poaching customers from Oracle. From all I’ve read from those who are in a position to know, Oracle’s database License and EULAs are /horrible/, much worse than even MS. So in that regard, while it’s certainly nothing people and businesses truly in the freedom world are likely to take up, that’s not the people this is aimed at. And for the Oracle users this is aimed at, believe it or not, there’s an extremely good chance that the MS devil is far easier to live with than the Oracle devil. But that doesn’t change the fact that from a freedomware perspective they’re both servantware/slaveryware devils, requiring some degree of selling your soul as a condition of use, it’s simply a matter of better terms under which you agree to sell your soul. Unfortunately, there’s a lot of folks out there who have made the worse deal, and for them, this may well offer an out. All things are relative, and while an MS deal remains a relatively horrible deal from a freedomware perspective, it really is likely to be jumped on as the much better deal it likely is, to those who are now suffering under an Oracle deal. After posting the above reply, I continued following my feeds, and came across this case in point, a prime example of why/how the Oracle database licensing devil may well be far worse than the MS database licensing devil. Bottom line for those not wishing to click thru, Oracle licenses by the CPU, but Oracle and VMWare define hardware partitioning differently, such that organizations deploying on VMWare and not astute enough to get specific contracts locked in up front or to take limiting measures, can find themselves on the line for millions of dollars in license fees in the event of an Oracle audit, as Oracle’s default license language and definitions then lets them charge for all hardware the database /could/ have been deployed on organization-wide, regardless of how many it was /actually/ deployed on. To illustrate, as an article-linked twitter comment suggests (but I won’t link directly and thus hopefully avoid the post looking /too/ spammy), if Oracle owned car parks and used a similar scheme, they’d charge you for all the spaces in the car park, since you /could/ have parked anywhere inside. With such a draconian license policy it’s little wonder many with experience consider Oracle the devil incarnate. Clearly, they’re both slaveryware devils, but MS could be pretty evil and still come off looking like an angel compared to that. Meanwhile, from the MS perspective there’s a lot of room for Oracle to drop prices to try to counter the MS sales tactic, while still leaving room for both MS and Oracle to continue to rake in the licensing cash, as “free for the life of the product” /doesn’t/ say /anything/ about what future upgrades will cost. Both Microsoft and Oracle are so anti-foss that I don’t really care what they do. That said, it would be fun to watch them slug it out. it’s unlikely that novell was trying to poach red hat customers in 2011, because by then it had been bought by attachmate and suse was back in nuremberg operating as an independent business unit. maybe suse was trying to poach red hat customers. Struggle for survival. If Microsoft and Amazon fail to poach Oracle’s customers now then Oracle probably will one day end up mopping up all their cloud customers. Maybe Larry Ellison could retaliate against Microsoft by hurting Java on Windows. Oracle’s own customers getting hurt in the process doesn’t matter. Collateral damage. This is war amongst powerful egos!